Competing projects, or the “Twin Films” phenomenon,” is nothing new for Hollywood. Whether we’re talking about Armageddon vs. Deep Impact, Volcano vs. Dante’s Peak or the time there were two Lambada movies or dueling Prefontaine films, the mechanisms of showbiz sometimes line up to produce movies with similar plots released in close proximity to one another. Now we’re experiencing it in the world of streaming, with competing documentaries about the Fyre Festival fiasco of 2017. Netflix had been touting their exposé, FYRE: The Greatest Party That Never Happened, which is set to premiere January 18, for a few months now. This past Monday, Hulu dropped its own Fyre Festival documentary, titled Fyre Fraud, seemingly out of nowhere, as a passive aggressive ploy to kick up some dirt and fire a shot across Netflix’s bow. No sooner had I finished watching a screener of the Netflix doc and writing up an advance review of it (read the FYRE review here), Hulu announced that their own film was available to stream right that second. So in the interests of all who, for better or worse, simply can’t consume enough of this laughable sham, and still find uproarious delight in wealthy millennials paying ten grand a pop to get served cheese in the mud, I’ve also watched Fyre Fraud so that I can compare the two docs, let you know what the differences are, and calculate which might be the more insightful watch. First up: A bit of behind-the-scenes scuttlebutt. The creators of both projects have been lobbing volleys back and forth over this, with Jenner Furst and Julia Willoughby Nason, directors of Fyre Fraud, criticizing that Netflix’s project was co-produced by Jerry Media (who are considered culprits in the festival’s ferocious failure) while FYRE’s director, Chris Smith, has scolded the Hulu doc for paying con artist extraordinaire Billy McFarland (an undisclosed amount) for an on-screen interview. So if you’re at all concerned about the fangs being flashed between the competing companies and respective documentarians, that’s the basic deal. This isn’t a formal review of Fyre Fraud, with an end score or anything like that, and to present an overall neutrality I’d say both docs are worth your time. Again, as most of you know, this is some of the sweetest schadenfreude in years. We may never tire of it. Netflix’s offering, however, is a much more “boots on the ground” endeavor, utilizing mass found footage and talking to the actual people involved with the task of trying to produce and deliver this cursed concert. The interviewees look directly into the camera and do their best to explain how everything spiraled into s***. Fyre Fraud, Hulu’s morsel, is definitely the glossier, shinier choice. It’s a much more “produced” documentary, and what one would expect a traditional mainstream doc to be. It has a pronounced score, it has montages, songs, and clips from TV shows and movies (like Family Guy and The Office). It comes with a ton more bells and whistles, and most of the people interviewed, aside from McFarland himself, are journalists. They don’t look into the camera as the Q&A set up is done in that “everyone looks and talks to the asker sitting off-camera” style. 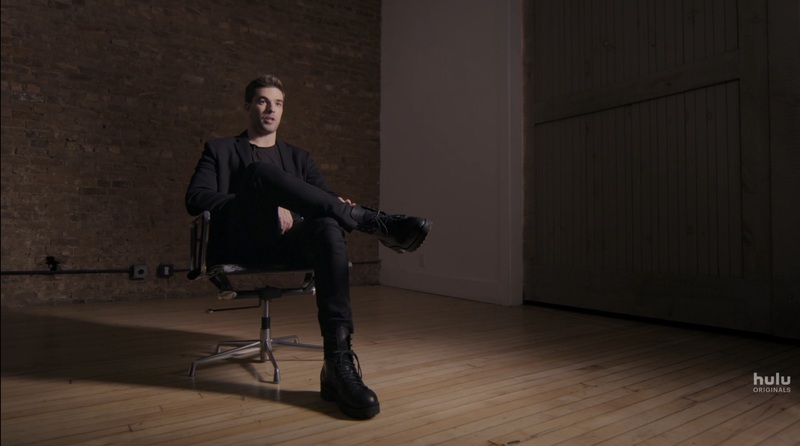 Flim-Flam Man Billy McFarland in Hulu’s Fyre Fraud. Both documentaries explore the lead up to Fyre Fest, the disaster of Fyre Fest, and fallout from Fyre Fest, but Fyre Fraud opens with a broad overview, explaining to viewers (maybe those who hadn’t heard about any of this) what they’re about to witness, before diving into the nuts and bolt. Fyre Fraud also tackles the psychology of the millennial and the “FOMO” phenomenon, which is the currency McFarland uses, and the fear he exploits, to swindle his peers out of money. Mostly though, as you might expect, the biggest difference between the two docs is McFarland himself. Having watched FYRE first and the Hulu doc second, I can say that McFarland doesn’t add anything to the actual information learned, but since he’s a big part of Fyre Fraud, it does delve into his shady background a lot more. And when he’s on camera he’s 100% (or maybe 99.99%) delivering a “little boy lost” character. As a slick salesman addicted to bilking people out of their bucks and/or bitcoin, Billy is a lovable chatterbox who can talk a man adrift in the ocean into buying a bucket of salt water. But when he’s called on to take responsibility for his actions he plays up a “deer caught in headlights” caricature that’s meant to rope in sympathy for a baby-faced boy overwhelmed by the world of high finance. While FYRE does a better job of showing you the people who top-to-bottom suffered because of the Fyre Festival, Fyre Fraud waves a fiercer finger at the many people, aside from McFarland, who were responsible to the point of being shrugging accomplices (Ja Rule, Jerry Media, etc). To reiterate though, both docs are worth your binge if you have a Fyre Fest-sized hole in your soul that can never be satiated. Fyre Fraud is the more polished product, sure, and watching it after FYRE makes its stylistic choices stand out more, but they also tend to stand out as somewhat obvious owns. The use of robo-toned text-to-speech when quoting McFarland’s mother? A graphic of Grant Margolin’s head (the much-maligned Fyre marketing chief) spinning around? Then again, Fyre Fraud’s souped-up qualities might make it more digestible. Matt Fowler is a writer for IGN and a member of the Television Critics Association. Follow him on Twitter at @TheMattFowler and Facebook at Facebook.com/MattBFowler.